Continuing on my chevron quilting theme , here’s a photo of a quilt I recently completed for a friend’s housewarming. I used a deep purple for one section of the chevron, and a feature lime green and purple fabric for another chevron section. White was used for the stitch in the ditch quilting, and lime green was used for the feature quilting, to try and pop against the purple fabric. I stitched on either side of the purple chevron section to accentuate it more, and I think it really worked. 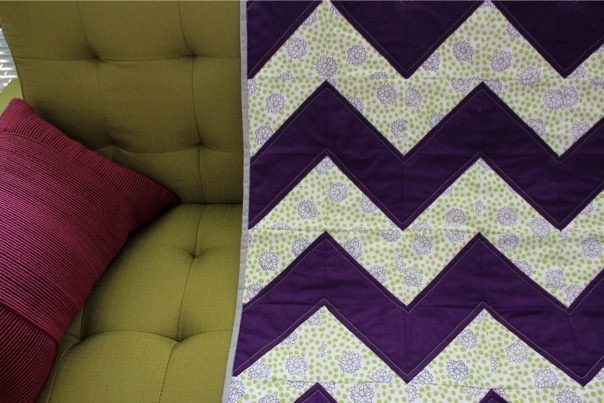 I use the traditional half triangle method for my chevron quilts, and haven’t tried any other way. Next time I might give the square method a shot, and see how I go! This is the biggest quilt I’ve completed so far, just shy off a single bed spread, and it was soo hard to tackle it in my baby Brother machine. « & A Cross Stitch Initial. Pingback: & A Chevron Home Sweet Home Cross Stitch | crosstitchery.